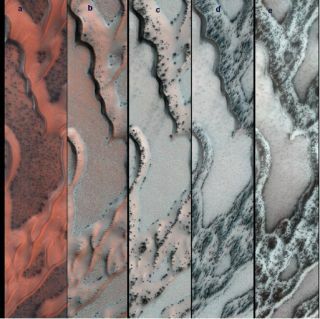 NASA's Mars Reconnaissance Orbiter snapped this series of pictures of sand dunes in the north polar region of Mars, showing how dark sand rises to the top as spring progresses (from left to right) and a surface layer of carbon dioxide ice cracks . The area covered in each panel is about 0.8 mile wide. The seasonal thawing of carbon dioxide ice near Mars' north pole carves grooves in the region's sand dunes, three new studies reveal. The discovery, made using observations from NASA's Mars Reconnaissance Orbiter spacecraft (MRO), reinforces that the Red Planet's surface continues to be transformed today, even though Mars' volcanoes have died out and its liquid surface water apparently dried up long ago. "It's an amazingly dynamic process," Candice Hansen of the Planetary Science Institute in Tucson, Ariz., lead author of one of the studies, said in a statement. "We had this old paradigm that all the action on Mars was billions of years ago. Thanks to the ability to monitor changes with the Mars Reconnaissance Orbiter, one of the new paradigms is that Mars has many active processes today." The phenomenon is driven by the springtime thawing of a surface layer of frozen carbon dioxide, also known as dry ice. This thawing occurs first on the ice layer's underside, which is in contact with the warming ground, researchers said. The dry ice sublimes from a solid state to a gaseous one, and pressure builds as more and more gas is produced and trapped. Eventually, cracks form in the ice and some of the carbon dioxide gas breaks free, forming temporary grooves in the dune as it hisses out. The escaping gas also carries sand, which forms dark streaks as it spills across the dry ice covering the dune. These dark fans disappear as the seasonal ice evaporates, and Martian winds erase most of the newly formed grooves before the next winter and springtime roll around. The grooves are smaller versions of the "gullies" MRO has spotted on other, steeper Martian dunes, which were apparently formed in a similar way, researchers said. And similar processes have been observed near the Red Planet's south pole. "It is a challenge to catch when and how those changes happen, they are so fast," Ganna Portyankina of the University of Bern in Switzerland, lead author of another one of the studies, said in a statement. "That's why only now we start to see the bigger picture that both hemispheres actually tell us similar stories." The three new studies, which appear in the journal Icarus, were based on observations made by MRO over three Martian years, or about six Earth years. The papers document a variety of seasonal changes on Mars, including the dune grooves and the distribution of water frost, which is blown around by springtime winds.